NASHVILLE, TN – Nashville-based roots singer/guitarist, Beth Garner, has announced a February 24th, 2017 release date for her new CD, Snake Farm, on The Music of Nashville imprint, via CEN/RED Distribution, a division of Sony Music. Snake Farm features mostly original songs written or co-written by Garner, with the exception of the title track, authored by Texas country legend Ray Wylie Hubbard. 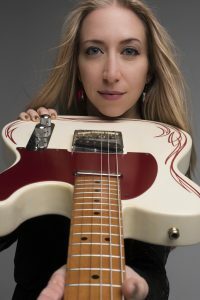 Garner’s music on the new album showcases her soulful singing, with its roots firmly in blues, gospel and soul with rock ‘n roll flourishes, as well as her scintillating axe work that alternately smokes and sizzles on both standard, and slide guitar. Recorded mostly live at Slack Key Studios in Woodbine, Tennessee, Snake Farm was produced by Garner and Randy Kohrs. The backing band features Rory Hoffman (sax, keyboards and rhythm guitar), Wes Little (drums), Steve Forrest (bass) and Angela Primm and Gale Mayes (background vocals). A Texas native, Garner spent a number of years playing in the Austin music scene before relocating to Algood, Tennessee in 2007, not originally to play music, but, “to build a blimp for the Department of Defense,” she says. “I worked for my uncle in a warehouse with bad heating. In March, 2007, I began a three-month US tour with Russian band The Red Elvises, where we played small sold-out venues from coast to coast. I gained a lot of fans and learned about our great country from the back of a van full of Russians.” After the tour, Garner returned to Tennessee and started playing for tips in the biker bars that dotted the small byways around the small town of Cookeville. Garner soon picked up a gig with local icon, Shelly Bush and Broadband, solely on the fact she was a female lead guitar picker and didn’t have that much hard-core country experience. From there, she started playing the Full Moon Saloon in various country bands, eventually getting her own shift, gaining musical chops and showmanship and also picking up the slide guitar.